Today's party is brought to you by the letters I, J, and K.
(I) can be a challenge, but I thought I would share my Italian Tea Set from Italy. It belonged to my grandmother and was passed on to me as a gift in our first move away from our home state of Michigan. It remains in perfect condition and I love it. Grandma knew I would care for it always. The set is shown here with 2 cups but I have all 6 in the set. I have displayed it throughout my cottage home, but for now it shows beautifully on my vintage cedar chest at the foot of the bed in the master bedroom. The next letter is J and Vintage Jewelry comes to mind. Through the years I have gathered a nice collection of vintage jewels collected and passed down from my mother and grandma. Here are a few pins and earrings with pin sets. Lastly our letter is K another challenging letter, but I have a few things in the knick knack catagory to share. Bird figurines have always been a favorite of mine since I was first married and these are a few from my collection. 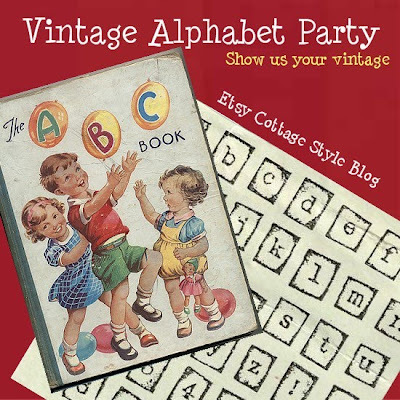 This concludes my Vintage Alphabet Party and the sharing of a few treasures this time. I so look forward to the next set in about a month. In the meantime, I have a lot going on in the studio to keep very busy. Many new hand painted and designed pretties coming your way to my shoppes. Speaking of studios and creatve spaces. This past weekend's Where Bloggers Create Party was fantastic and so inspiring to visit the many wonderful spaces around blogland. If you are still visiting parites, I would love for you to attend mine by clicking HERE and going to that post for my Creative Space. From that post you can also click to visit the many others that participated. This year's party had 450 participants, so we may be partying all Summer long! You will enjoy the fantastic spaces that Creative Bloggers call their own. Big or small they are all special! Enjoy and till next time, remember Stephanie of Angelic Accents Wedding Blog Party coming this Friday the 25th. I will be there and I hope to see you too. Awwww...Celestina.... Your tea set is all that much more wonderful hearing how you got it. I love the knick-knacks but my absolute favorite is all your vintage BLING!! Love it!! I so enjoy seeing your "Alphabet" goodies! Your grandmother's Teaset is beautiful and such a treasure. Of course I love all the bling and it is even more special when it belonged to a loved one before ~ do you have any photographs of your relatives wearing some of it? I love that sweet silver teapot lamp and the precious little pink-breasted bird planter next to it. Don't think I've ever seen either of those before ~ what room are they in? You are just too sweet to post about the WEDDING party again! I think we are going to have a great time Friday. Looking forward to what you will be sharing, sweets! Celestina, your pictures are lovely! I really like the tea set as well as all the beautiful jewelry! Thanks for sharing! wow! I am drooling over the brooches! Oh My what great goodies you have to share with us. I love all the vintage jewelry most! Thanks so much for your visit last week. I have not had much time to just sit and am finally getting back with dear friends who stopped by. Hope this finds you and your family well. Blessings to you my sweet friend! Hi sweet Celeste! Beautiful blog today! The tea set is beautiful. Hi Celestina! So glad you got to join in the party! "k"nick-knacks went to the birds. Your vintage alphabet has so many special finds. What a lovely selection of Vinatge pieces Celeste...it's all gorgeous, but I must admit I do have a passion for tea sets and your is beautiful. Your treasures are beautiful Celestina - I especially like your vintage jewelery. They did sparkly turquoise like no other since! Great Alphabet collections! The jewelry is lovely and how clever of you to think of Knick Knacks for "K"! Gosh what a great job you did for the alphabet! I just love vintage jewelry too and I am always on the look out for the next great piece to add! Happy Creating and sorry I missed the big blog party! I have received my beautiful pink tray! I love it! Thank you so much for the sweet extras too! This was wrapped so pretty, and came so fast. What a lovely post today and I enjoyed seeing some of the treasures around your home. I adore your sweet Italian teaset and even more precious that it belonged to your Grandmother. Also the jewellery is so pretty as are the cute birds. I hope that you are having a wonderful week. Celeste, I love all the vintage jewelry...what a gorgeous collection. I am visiting your blog for first time -& I am a follower now- and I am quite impressed!! The jewelry and decorative items are simply gorgeous; your blog is so neat!